The classic film will be featured on November 13 at 6:30 p.m. at the historic landmark Oswego Theatre at 138 W. Second St. The Oswego County Historical Society proudly presents the 75th anniversary of “Gone With The Wind” on November 13. From left are: Beth Krise, historical society intern with Mark Tesoriero, Lyn Patterson and Barbara Hanley, historical society board trustees. 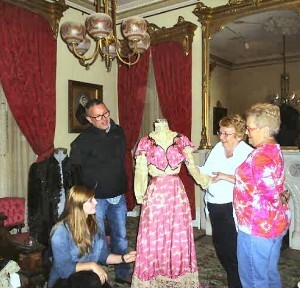 They are admiring a late 19th century gown from the historical society collections in the bedroom of Naomi Richardson at the Richardson-Bates House Museum in Oswego. The the room and gown are reminiscence of those seen in the movie scenes. All proceeds from the event will support the Richardson-Bates House Museum in Oswego. The movie tickets were designed by Oswego Printing to emulate the original ticket of the film premiere at Lowe’s Grand Theatre in Atlanta in December of 1939. “Gone With the Wind” is considered one of the greatest movies every made in cinema history. According to Guinness World Records it is also the highest grossing box office film ever with inflation. It has sold more that 283 million tickets worldwide. The movie will be shown in the main auditorium of the historic Oswego Theatre. The theatre was designed by prolific international theatre architect John Eberson in the Art Deco design. It opened to the public in January of 1941. It is listed on the National Register of Historic Places. Tickets are $20 per person and are available at the Oswego Theatre at 138 E. Second St. and river’s end bookstore at 19 W. Bridge St. Since the tickets were designed in keeping with the original one they will make a great souvenir.